Pumpkin spice, and everything nice. Nothing quite compares to the beauty of Jackson, WY, in the Fall. The surrounding colors are breathtaking. Vibrant reds, golden hues of yellow and orange, some of the brightest greens I've ever seen. Leaves are flowing through the air, falling from the aspen and cottonwood trees, dancing with the wind before the hit the ground. The air is crisp and cool but the sun is still shining, giving new life to the place I call home. All I want to do is cuddle with my kids by the fire and bake cupcakes. It's a new season. 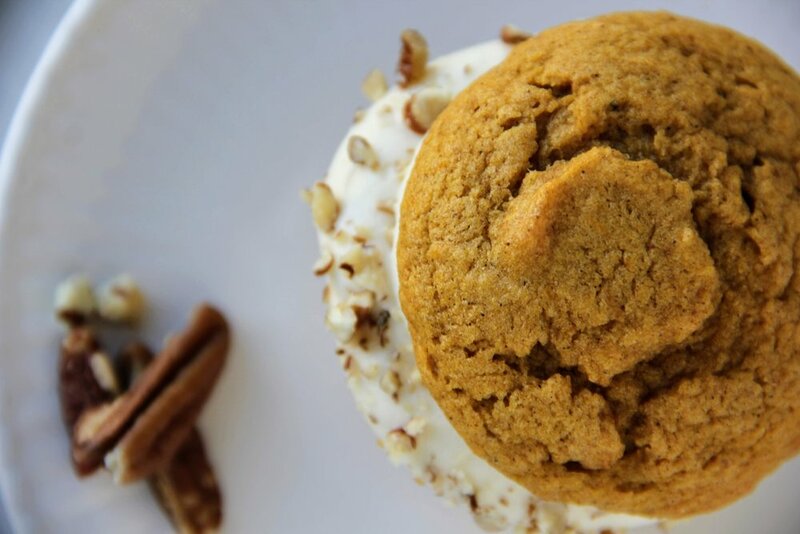 And lucky for me, a season for the ultimate Fall flavor: pumpkin! Spicy, hearty, and rich...and healthy, as it's full of nutrients and fiber. I love the gorgeous color pumpkin brings to baked goods. These may be my favorite cupcakes...although I feel like I say that about all my cupcakes. What can I say, I really love cupcakes. 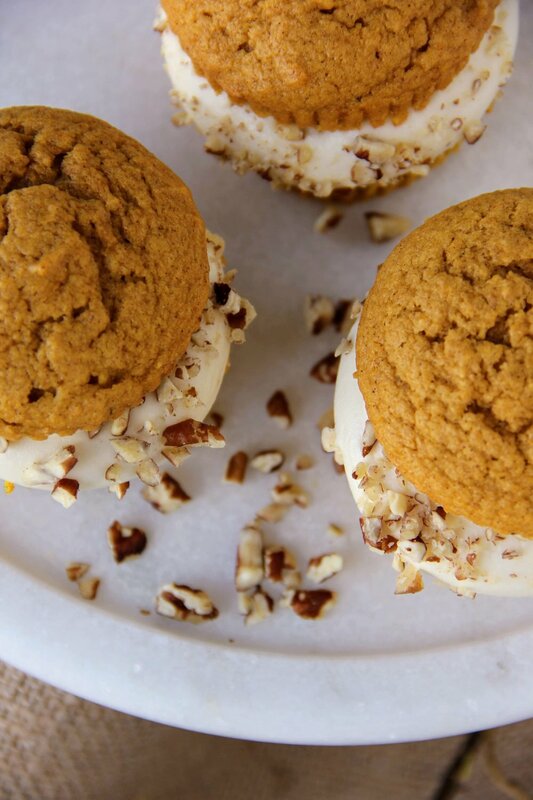 But this combination, pumpkin, maple, and cream cheese frosting, it's heavenly. It's Fall in a dessert. Do yourself a favor, top them with a generous layer of frosting, don't be skimpy, and then some toasted chopped pecans. Preheat your oven to 350°F (at high altitude 375°F). Line 2 cupcake pans with baking cups. In a medium bowl, sift together the flour, baking powder, cinnamon, nutmeg, allspice, and salt. Set aside. In an electric mixer, cream the butter and sugar till light and fluffy, about 3 to 5 minutes. Add the eggs, one at a time, beat slowly after each addition. Scrape down the bowl when needed. 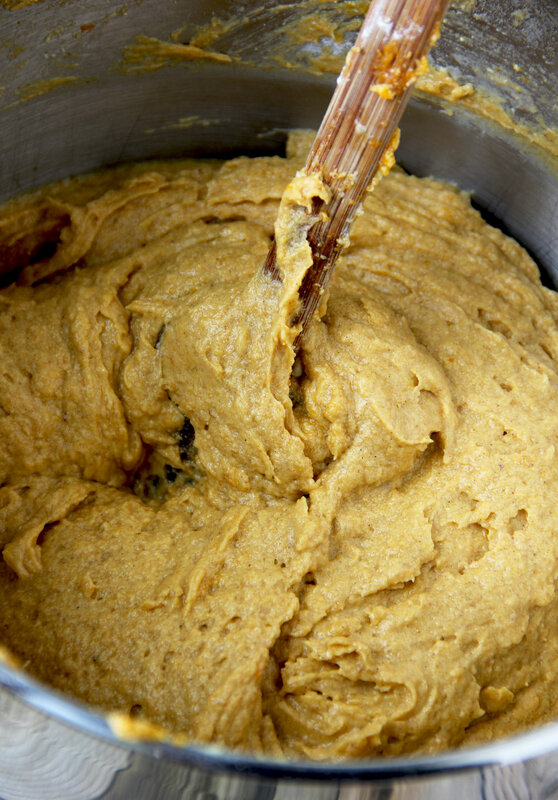 With mixer on low, add the pumpkin puree and honey. Mix till combined. Add half the flour mixture, followed by half the hot water. Scrape down the bowl when needed. Add the remaining flour mixture, followed by the hot water. Mix till just combined. With an ice cream scoop fill each baking cup with batter 2/3 full. Bake for 25 to 30 minutes, till a tester comes out clean. Allow to cool completely on a wire rack while you make the frosting. In an electric mixer, cream the butter and cream cheese till smooth. Add the maple syrup and vanilla. Scrape the bowl as needed. With mixer on low, add the powdered sugar. When fully combined, mix on high speed for 2-3 minutes till light and fluffy. Top each cupcake with a generous layer of frosting and sprinkle with chopped pecans.